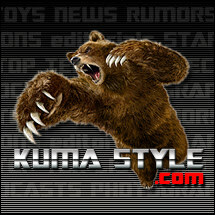 Toy Nippon: BBTS News: Spring Sale - 7000+ Items! The Walking Dead, Aliens, DBZ, Sideshow, Transformers, Imports & More! BBTS News: Spring Sale - 7000+ Items! The Walking Dead, Aliens, DBZ, Sideshow, Transformers, Imports & More! Sheriff Rick Grimes will soon join Daryl Dixon as the next 10" Deluxe figure. He is listed at $32.99, $7 off the MSRP. The new assortment of TV Series figures includes Abraham Ford, Bungee Guts Zombie, Carol Peletier, Hershel Greene and Rick Grimes. They are available as a Set of 5 for $69.99, or as a Case of 12 (one or more of each figure -- exact breakdown currently unknown) for $159.99. We also have singles listed for each figure at $14.99 apiece. Note that this assortment lineup is subject to change. This quintet of stylized superdeformed figures includes Optimus Prime, Bumblebee, Grimlock, Starscream and Soundwave. Each figure contains light-up eyes, and the set of 5 is listed at $119.99. The second figure in the new line is of a Lurker, who hide in the shadows and prowl on the hunt as opposed to the Warrior caste. It comes with an egg, a facehugger and three sets of hands, and is listed at $19.99. Following up on the announcement of Android 18 comes its twin, Android 17. Android 17 comes with alternate hands, faces, hair and arms as well as a gun with holster and more. This figure is listed at $39.99. General Thunderbolt Ross' Red Hulk form is the subject of this new Premium Format statue. He is sculpted with an evil grin and is listed at $549.99. The leader of Gandalf's group of Maiar Istari, Saruman eventually succumbed to the evil he was originally to stand against. Saruman stands 26" tall atop his staircase base, and has cloth robes and a Palantir in his outstretched hand; we have it priced at $399.99. These 3" figures are articulated at the head, shoulders, hands, legs and ankles, and are packed randomly. They include the four Turtles, Shredder and more, and come with accessories; they are listed at $207.99 for a Case of 16 random figures, or $12.99 for a random single. These 3" figures wobble at the base and are packed randomly. They include characters like Contractor Potato, Clown Potato, Baked Potato, Punk Potato and more, and come with accessories; they are listed at $207.99 for a Case of 16 random figures, or $12.99 for a random single. This piece makes an excellent weapon for a large soldier from the recent transforming robots cartoon. It is done in a blue and red color scheme and is listed at $27.99. The first of two new versions of Badbat, this one changes from black bat to cassette and has what we assume are gold ears. It is priced at $39.99. This black transforming bat changes into a cassette as well, but come with silver radar, that presumably becomes ears. It is listed at $39.99. A variety of new Gundam and Yamato items have been announced for the coming months. They include a 1/100 Scale Turn X Gundam kit, a 1/500 scale Space Battleship Yamato 2199 Expansion Set, multiple 1/144 scale Gundam sets and Gunpla Builder items and more. Evolution Toy's new version of Gaiking stands about 7.5" tall with plastic and metal parts. He comes with the Stinger wing, alternate hands, a full set of weapons with shield and more, and is listed at $269.99. Gaming Heads is producing a new 1/6 scale statue of Ratchet and Clank. It stands 15" tall to the top of his weapon and is limited to 750 pieces worldwide; we have this piece listed at $199.99. Another group of import exclusives has been listed. These include the Robot Damashii Full Armor ZZ Gundam at $149.99, Armored Girls Project MS Girl Unicorn Banshee at $144.99 and Unicorn Gundam Full Armor Parts Set at $89.99, One Piece Tony Tony Chopped Cherry Blossom Wallet Exclusive at $259.99 and more. This new assortment from Bandai includes Godzilla, Mechagodzilla and a mystery character. They come as random singles for $6.99, or as a Box of 12 for $69.99. We have a whole bunch of new board games up for pre-order. They include Risk, Monopoly, Clue, Connect 4 and more from licenses like TMNT, Doctor Who, Starcraft, Pokemon, The Big Bang Theory, Transformers, Super Mario, Firefly, WWE and more. Take a look at all of these new games at the link. This anniversary print of the original poster design for "Ghostbusters" measures 27" x 40" on 100# satin finish paper and is listed at $19.99. The new Autobot Three-Pack includes Ironhide, Mirage and Hound, while the Decepticon Three-Pack has Galvatron, Octane and Astrotrain. Each figure contains new paint and/or detailing, and each is listed at $129.99. This figure stands about 12" tall and features an oval-shaped torso, a light-up Portal Gun and light-up Optical Sensor. It is listed at $189.99, $30 off the MSRP. P-Body's counterpart has a round torso and also includes a light-up Portal gun and light-up Optical Sensor. It is also listed at $189.99, saving you $30 off of the MSRP. This import figure is listed at $59.99 and comes with his pistol, his whip, a golden idol, a Sankara Stone, the Holy Grail and a display base. This upgrade kit for your TFC Toys gestalt includes a new head sculpt, a new laser cannon, new arms and more, and is listed at $49.99. This shoulder cannon can attach to either side and contains a permanently-affixed silver 'missile'. They are listed at $4.99 each. This warrior comes loaded with a number of guns and melee weapons. He is listed at $16.99. This assortment includes three of the 12th Doctor Regenerated, two each of a Zygon, the 11th Doctor and a Dalek with Claw, and one each of an Imperial Guard Dalek (Black Dome with Sensor), a Screaming Angel and Clara in Red Dress. This Case of 12 is listed at $119.99; we also have them as a Set of 7 for $84.99. Singles are listed for the 12th Doctor Regenerated, a Zygon, the 11th Doctor and a Dalek with Claw, at $8.99 - $12.99 each. The Black And White line continues with this Gary Frank version, taken from the Batman: Earth One graphic novel. It stands about 7" tall and is listed at $69.99, $10 off the MSRP. This new limited edition piece shows Huntress in her black, white and purple outfit, ready to fire her hand crossbow. It stands about 9.8" tall and is priced at $84.99, saving you $15 off of the MSRP. This light-up lantern burns with the power of love and stands about 11" tall. It comes with a ring and ring stand and is listed at $169.99, $30 off the MSRP. This Imperial Seal set is done in stark black and white and can be used for books, DVDs and more, or just displayed together. They are listed at $62.99, $7 off the MSRP. This warrior comes with a removable mantle, alternate hands and a display base. He stands about 8" tall and is listed at $109.99. Blake Griffin's new 1/6 scale figure comes with a magnetic basketball, red outfit, alternate hands and head, and a display stand. It is listed at $224.99. Like Blake Griffin's figure, this one comes with a magnetic basketball, red outfit, alternate hands and head, and a display stand, in addition to an MVP Trophy. It is listed at $224.99. Last but not least, Kobe Bryant comes with a yellow outfit, a magnetic basketball, alternate hands and head, a display stand and more, and is also listed at $224.99.